Cut a hole in the lid of the shirt box. Create a fishing pole by attaching a piece of yarn or string to one end and tying a magnet or piece of magnetic tape to the other end for “bait”. 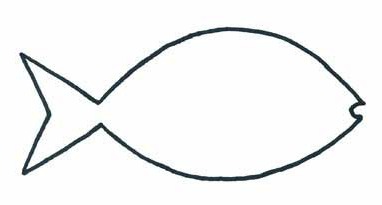 Copy the fish pattern below onto different colors of construction paper and label each fish with a letter, number, color word, sight word, number sentence, or whatever skill you wish to review. Attach a large paper clip to each fish. Place the fish inside the box. Explain ice fishing to the students. Pretend the white box is a block of ice and that you cut a hole in it for ice fishing. Have the students drop the fishing line into the hole and catch a fish by placing the magnet (bait) by a fish’s paper clip. When they pull out a fish they must say the letter, number, word, etc. on it. This is an example from my Letter I Unit.